Cruises International has teamed up with Trafalgar and they're offering you a chance to enter once to win a nearly TWO WEEK LONG vacation in beautiful ITALY, worth more than $10,000! 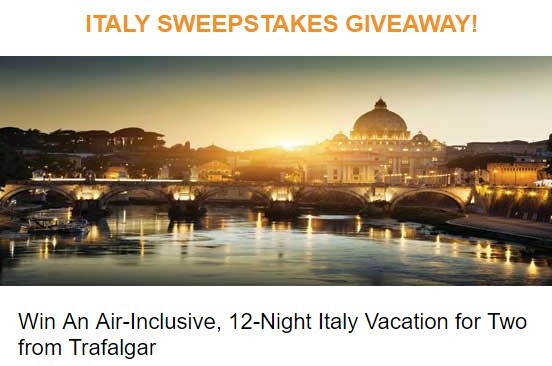 Prize: One (1) winner to receive Trafalgar’s 13-day Best of Italy for two (2) adults. What’s included: Round trip airfare from United States to Rome, 12 nights’ accommodations in twinshare room, 12 full breakfasts per person, 7 dinners per itinerary per person. Actual retail value of package: up to $10,300 depending on travel date.